ACK! Too many things going on! 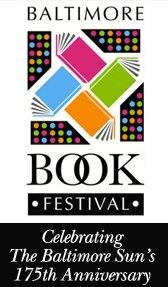 I will only be appearing at the Baltimore Book Festival one day: this FRIDAY, SEPTEMBER 27TH. I will be around all day (or, as soon as I can arrive) to sign books (I’ll bring as many copies of HERO as will fit in my suitcase). It doesn’t look like there will be much time between my panels, but fear not — I will definitely stick around until everyone has gotten their books properly defaced by MOI! I will be making appearances on Saturday and Sunday at both the Maryland Romance Writers Stage and the Science Fiction Writers of America tent. The festival is free to the pubic (though you’ll probably have to pay to park somewhere). There WILL be books for sale. Come see me! Summary: Authors will talk about what’s hot in young adult romantic fiction and share readings from their latest works. Panel: WHERE DID THAT COME FROM? Summary: Authors share inspirations for plots, characters, and settings. Nothing is too bizarre to discuss! Summary: Authors will talk about how to create engaging fiction based on fairy tales, folklore, mythology, and history, and how to make those old stories new, fresh, and exciting. Leanna Renee Hieber and I will be teaming up with our fellow SFWA authors and participating in the Baltimore Book Festival on Saturday, September 24th. The festival is located on Charles Street in Baltimore, which will be closed to traffic for the festivities. Click here for driving directions. I will have midi-sized copies of AlphaOops: H is for Halloween available, as well as a few copies of Magic & Monsters and exclusive Janet Lee prints from our upcoming A is for Alice! I will also be giving away all those bookmarks that I forgot to bring to Dragon*Con. Join authors Brenda Clough, Alethea Kontis, Leanna Renee Heiber, Catherine Asaro, Alan Zendell, and Allison Pang to chat, have your books autographed, and win prizes. Panelists K.D. Hays, Catherine Asaro, Leanna Renee Heiber, and Alethea Kontis talk about the biggest selling genre in fiction. Why do “young” adult books such as the Harry Potter series appeal to all age groups? How do we define YA and how can you break into that market? Panelists Brenda Clough, Alethea Kontis, Leanna Renee Heiber, and Danielle Ackley-McPhail talk about one of the hottest new genres in speculative fiction. What accounts for the current fascination with steampunk and Victoriana? Just what exactly is Steampunk? Panelists will talk about the genre as a whole and discuss their favorites. Come hear readings from Leanna Heiber and Alethea Kontis, two of the hottest, bestselling authors in paranormal and steampunk fiction.